The Outer Banks Brewfest in Nags Head will feature the area's culinary, performing, and visual arts through a craft beer culture event including more than 80 tasty libations from around the country. The inaugural craft brew event offers: tastings, workshops, guest-speaker panels, local Chef pairings, live entertainment, art and many fellow aficionados. Expect an experience like no other featuring everything from homebrew demonstrations and beer-centric workshops hosted by industry professionals, to live music. There will also be a unique “Games for Grown Folks” field day-style game zone which will be chock full of activities including life-sized Jenga, keg bowling, human foosball, life-size Connect Four and much more. Non-drinkers can also enjoy samples throughout the day in the festival’s Soda Garden, which will house over twenty handcrafted sodas. There will be many local restaurants providing food, available for purchase throughout the event; some of whose culinary teams will also be presenting segments such as “Cooking with Beer,” “Homebrew 101,” “Beer & Cheese,” “Repurposed Beer Art,” “Design Your Own Beer Garden,” “Plant to Pint: Where Your Beer Comes From,” etc. 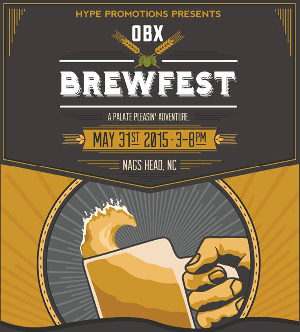 OBX Brewfest will inspire and showcase the area’s finest culinary, performing and visual arts through a craft beer cultural event boasting 80-plus tasty libations from around the country. The fest will feature everything from home brew demos plus craft beer workshops hosted by industry professionals to an adult game zone making the event a must see for beer enthusiasts. Outer Banks Attractions, Vacation Rentals, Restaurants, etc.